The San Rafael Valley was identified in the early 1970s as a proposed natural area because it represented one of the finest stands of native grassland in the State. These grasslands have not suffered the problems of shrubs and cactus invasion nor have they been taken over by exotic plant species that affect so much of this vegetation type elsewhere in the State and the Southwest. The valley extends over 90,000 acres and lies at the headwaters of the Santa Cruz River between the Patagonia Mountains, Huachuca Mountains, and the Canelo Hills. Marshy springs feed the river and the floodplain that includes several swampy stretches. Two springs located within the San Rafael Ranch are Sheehy and Sharp Cienega Springs. Sheehy is considered the older of the two and is dominated by stands of cottonwoods. The great importance of the San Rafael Valley is an intact landscape, unfragmented and relatively undisturbed from the mountain ridges down to the valley bottom. The San Rafael Valley is home to a wide variety of plants and animals. The U.S. Fish & Wildlife Service estimates the “Madrean Sky Island” bioregion (which the valley is part of) harbors the greatest diversity of mammal species in North America. Big game species are abundant in the valley and surrounding mountain ranges. White-tailed deer, mule deer, and javelina are the most common species. Pronghorn antelope were reintroduced in the valley in the 1950s and the herd now numbers about 60 animals. Rare species found in this area include Canelo lady’s tresses, Mexican garter snake, Huachuca tiger salamander, Gila topminnow, Gila chub, Sprague’s pipit, and Baird’s sparrow. Since the establishment of the Natural Areas Advisory Committee within State Parks in the early 1970s, the San Rafael Valley had been on the priority list. 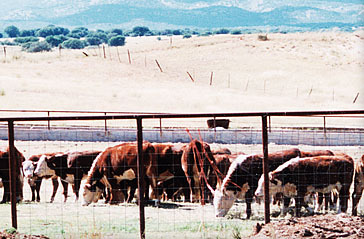 Cattle in the valley in 1998. Cattle ranching has been the predominant activity in the San Rafael Valley for approximately 175 years. The valley’s pristine condition is due largely to the land stewardship by the ranchers. Spanning 22,000 acres, the San Rafael Ranch is the center of the San Rafael Valley. 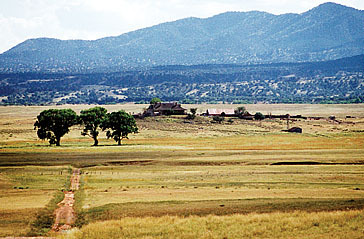 The Sharp family owned and ranched the San Rafael Ranch from 1903 to January 1999. The ranch consisted largely of the last fully intact Spanish land grant in Arizona and was the largest private landholding in the valley. 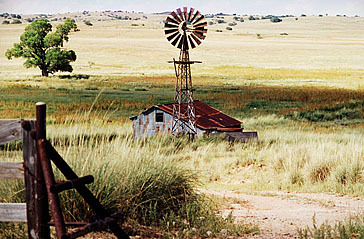 The ranch with its rolling grasslands and wide open spaces was used as the setting for the 1955 Hollywood movie version of the Rogers and Hammerstein musical, Oklahoma. In 1994, at the encouragement of Parks Board member Bill Roe, and long time acquaintance of Mrs. Florence Sharp, owner of the San Rafael Ranch, the Sonoran Institute held a workshop for those individuals who owned land in the San Rafael Valley. The ranch owners decided the most efficient way to protect the valley and their lifestyle was by conservation easements that would prevent subdivision and development of the ranches. Early in 1997, Executive Director Travous met with Mrs. Stevens, owner of the San Antonio Ranch, and Bob Sharp, manager of the San Rafael Ranch, at their request. Both parties were interested in seeing their properties conserved and wanted to know if State Parks was interested in being a partner with them to accomplish this endeavor. As a result of these meetings, appraisals were completed on the San Antonio Ranch and the Upper 17, a portion of the San Rafael Ranch. With the Parks Board’s interest in these areas, the Natural Areas Program Advisory Committee (NAPAC) scheduled its November 1997 meeting at Patagonia Lake State Park so a tour of both properties could be made. View of the Ranch House in 1998. NAPAC spent time making a thorough tour of the San Antonio Ranch and then went to the San Rafael Ranch to meet with Bob Sharp and tour the Upper 17. The thought, at the time, was State Parks could possibly acquire a part of the Upper 17, located at the north side of the San Rafael Ranch and purchase a conservation easement over the remainder of the ranch. The NAPAC toured the Upper 17 and determined the most desirable location for a visitor center that would have a view over most of the San Rafael Valley. As a result of the tour, NAPAC recommended that the State Parks Board acquire the San Antonio Ranch and the Upper 17. The NAPAC further recommended that the Board pursue additional opportunities for conservation of natural area values in the San Rafael Valley through conservation easements. At their January 1998 meeting, the Parks Board considered a proposal where the Board would acquire between 80 and 320 acres of the Upper 17 acreage for the development of a visitor center. A conservation easement would be acquired over the balance of the San Rafael Ranch. The Board instructed the staff to proceed with due diligence in activities pertinent to acquiring the conservation easement on the San Rafael Cattle Company ranch. By May 1998, the purchase agreement on that portion of the Upper 17 and conservation easement on the remainder of the San Rafael Ranch was ready to be finalized upon the completion of the property survey. In early summer the family advised the Parks Board they could not proceed with the present proposal because of tax issues and would have to list the ranch on the open market for sale. At the November 19, 1998 meeting, the Parks Board viewed the draft proposal in which State Parks would purchase 3,557 acres of land on the lower section of the ranch (See Appendix 5). This property included the historic 1898 ranch house. North of the property to be purchased in fee, the Board would acquire a conservation easement on the 17,574-acre San Rafael de la Zanja land grant that would ensure the property retain its scenic, undeveloped, natural condition. The land grant property would then be sold to a conservation-oriented rancher so it would continue to be used for ranching. The Upper 17, a 1,050-acre parcel of land above the land grant, would be excluded from the conservation easement held by the Parks Board. It would be protected by a conservation easement held by TNC and would allow TNC to become a partner with State Parks for the protection of the San Rafael Valley. Three small parcels, within the Upper 17, would be sold to Sharp family members. Following the discussion and public comment, the Board authorized staff to continue its due diligence process to acquire the San Rafael Ranch through a combination of fee simple and conservation easement purchases. With all the necessary documents reviewed and finalized, the Parks Board, at its January 21, 1999, meeting voted to acquire the conservation easement and fee simple land. The Parks Board became the owner of the San Rafael State Natural Area (conservation easement) and the San Rafael Ranch State Park (fee land) on January 27, 1999. Hollis Cook served as the first Park Manager.